Valentine's Day is swiftly approaching, and while some of us eco-minded folks are drinking the Hatorade on this largely commercial holiday (especially us single ones), it's actually a great opportunity to voice your choice for environmentally conscious products. 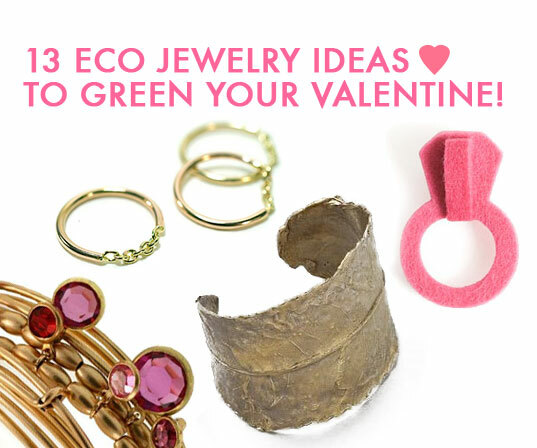 Jewelry is one of the most popular V-day gift items, right up there with flowers and chocolates, and there is a bounty of truly lovely, ethical, recycled, and fairly traded necklaces, rings and bracelets available for the taking. Check out our eco-jewelry gift guide for some stunning choices that you'll feel as good about giving as she'll feel about wearing. Give your eco-honey the key to your heart with this adorable necklace glittering with crystals. The charms are all vintage and have a lovely gingerbread patina. If your girl's style is natural and unique, she's sure to love this charming cuff bracelet made of reclaimed metals. And you're sure to reap the benefits! Is this hand-crocheted necklace made of vintage copper chain gorgeous or what? Your eco-babe will be absolutely floored when you present it to her! Perfect for a sophisticated girl who likes the simpler things in life, this petite chain ring is made of recycled 14-karat rose-and-yellow gold for a two-tone look that is as unique as your love. This fetching pendant and matching chain will glitter and glint just so on your sweetheart's neck. Plus, they're made of remnant zippers that would have otherwise been thrown out! Cut from the ends of vintage utensils, these silver-plated art deco earrings are all one-of-a-kind. And if you and your honey are both foodies, they're the perfect nod to the passion you share. If you want to give your eco-lovah a gift that is as one-of-a-kind as your love, look no further. This supercute nameplate necklace, made from recycled LPs, can be customized with your honey's name, or if you're really possessive, yours. These shimmery bangles by Alex & Ani will remind your eco-valentine of you every time she looks at them sparking on her wrist. The set of seven bangles features beautiful crystal charms and is made of reclaimed metals. If your boo appreciates the finer stylings of days gone by, she'll swoon for this delicate feather-shaped necklace by Old Hollywood. It's made from recycled metals and hangs on a delicate 18-inch sterling silver chain with lobster clasp. If you have a funny Valentine who enjoys a good dose of irony more than precious metals or gems, this "diamond" ring made out of 100 percent wool felt is the perfect gift to put a smile on her face. These absolutely stunning rings are made from responsibly mined lavender-, sea-blue-, ruby- and white-hued diamonds and precious stones that are fitted in reclaimed gold. They'll complement your better half's beauty perfectly. This stylish bracelet, made from recycled and deadstock chains, is the perfect accent for any modern girl's outfit and will have your own dirty librarian tickled pink! If you're on a budget this Valentine's Day, these recycled cuffs made from old records are the perfect stylish and affordable accessory to give. We especially love the red houndstooth pattern, but the toile, lumberjack, and shemagh are pretty neat, too.